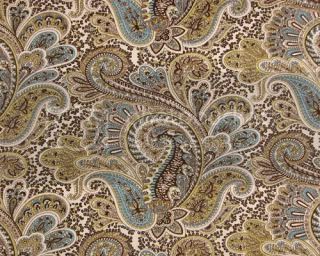 Classic paisley design fabric in the chocolate natural colorway combines dark chocolate brown, aqua blue, and a hint of green on a natural cream background. This heavyweight designer fabric is a 100%cotton and makes a lovely shower curtain! The paisley is a larger scale (12.5 x12.5 design). Custom valances are also available. This custom shower curtain measures 72x72 with a buttonhole top, deep weighted hem and is pattern matched at seam. Free fabric swatches are available.